I suppose I should make a formal introduction. My dad knew I was looking for a guitar so I could start teaching myself, and his co-worker’s daughter happened to be selling hers. I decided not to buy it cause I had no idea what it was, not to mention the fact that I’m notoriously picky about these kinds of things. He bought me the guitar anyway (using my birthday as an excuse), and I drove to Toronto to pick it up the first chance I had when I got back from Europe. I asked Steve to do a demo of the guitar because his skills can really show it off. 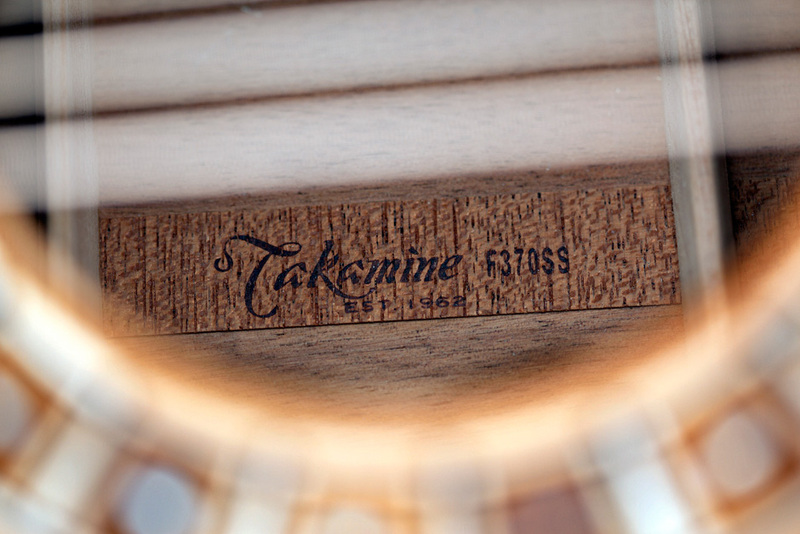 Takamine F370SS solid wood acoustic dreadnought. 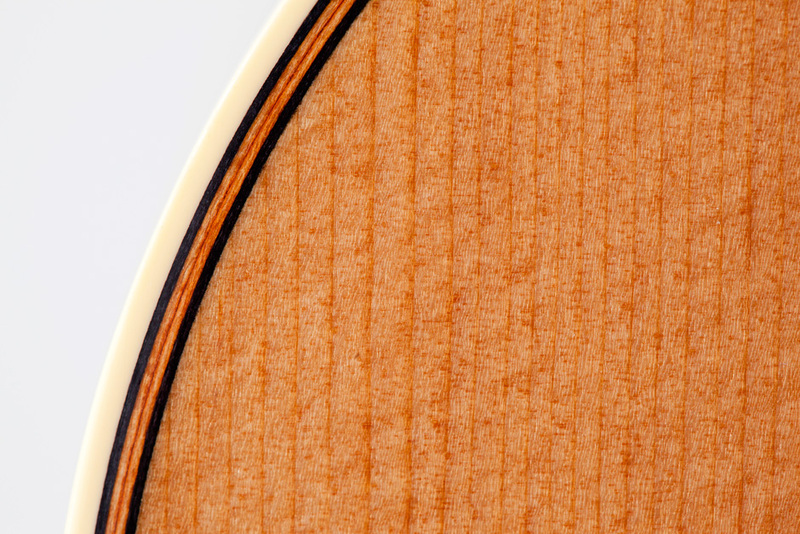 It turns out the guitar is absolutely gorgeous, with solid spruce on top and solid koa on the back and sides. And being handmade in Japan in 1999 — the only year this model was in production — makes it an instrument that will never be replaced. An heirloom I’ll pass down to my children if I ever have any. The colour looks a little darker and warmer than usual spruce, which leads me to believe the wood has already matured a bit. Rosette design made of rosewood, walnut, maple, and mother of pearl. I’m sure the koa contributes to the clarity of the tone, which is rich and bright. There’s lots of sustain through the entire range that seems to go on forever, like hearing delicate water droplets ringing in a cave. It plays like a dream. The action is set well for fingerstyle playing, though maybe a little too low for heavy strumming. But I tend not to really dig into the strings unless I’m drunk or high anyway. It’s has a nice heavy lacquer, which I’m hoping will make up for the lack of a pickguard. Solid koa back. The wood pattern doesn’t stand out as being distinctively koa to me, which usually has a heavier cross grain. The design is simple and minimalistic — exactly my style. Yummy honey colouring is yummy. I can tell it’s a quality instrument every time I pick it up. It feels solid and stable without being heavy. The finish is flawless. 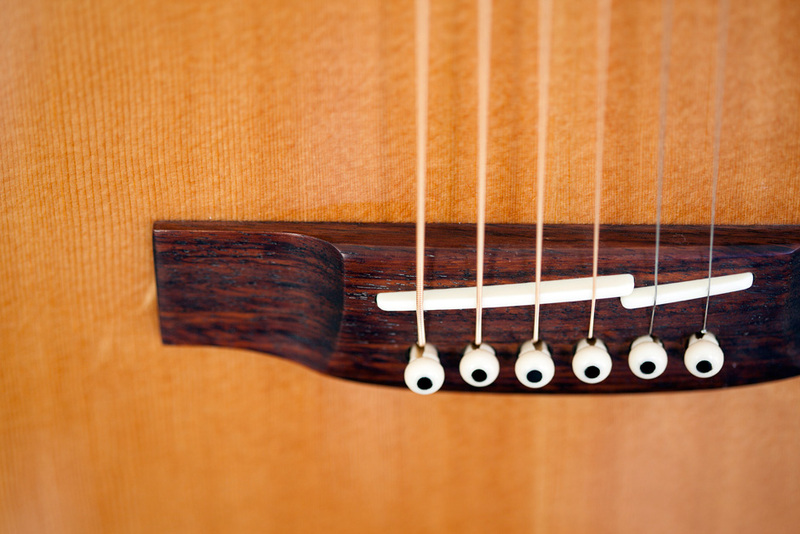 The tuning pegs are nice and tight, but I never have to tune it anyway unless I accidentally knock a peg on something. 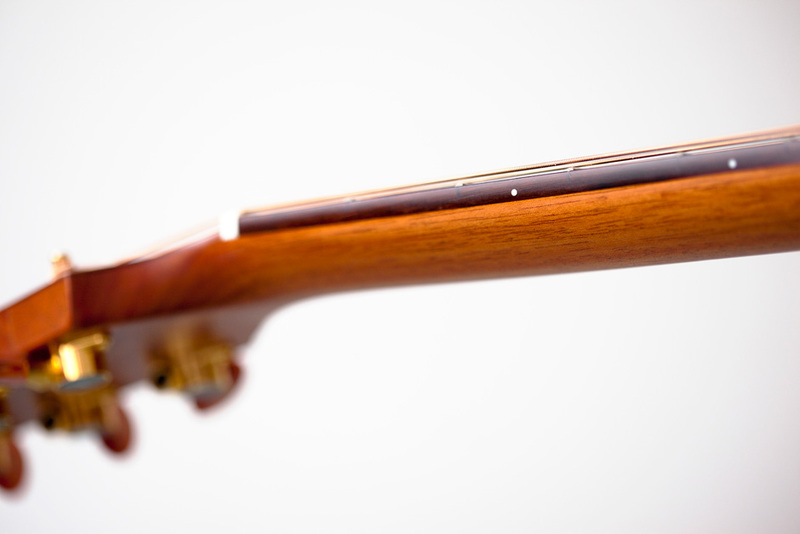 Rosewood fingerboard with a single marker on the 12th fret designed by Frank Lloyd Wright. I named it Larissa after Doctor Zhivago’s great love, Lara, whose life intertwines with his at several points and in many profound ways. She was already with someone else when she met him, as was he, but somehow fate brought them together (and eventually left them apart). In the same way, I wonder what this guitar has already been through before coming into my possession. What memories of it’s own does it have? What shows has it gone to? Who has it serenaded? What melodies has it played? It’s in such good condition that I wonder if the previous owner played it at all. 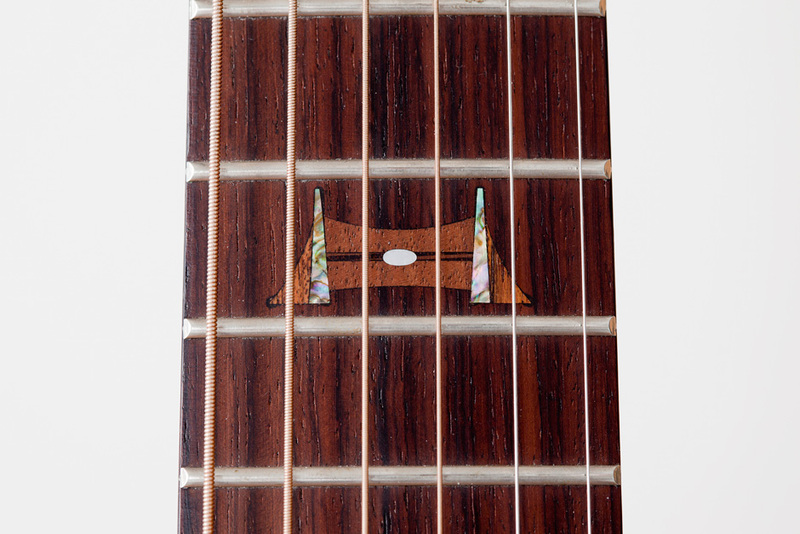 Single dot inlays on the 3rd, 5th, 7th, 9th, 12th, 15th, and 17th frets. That’s not to say I’ll never need another guitar. 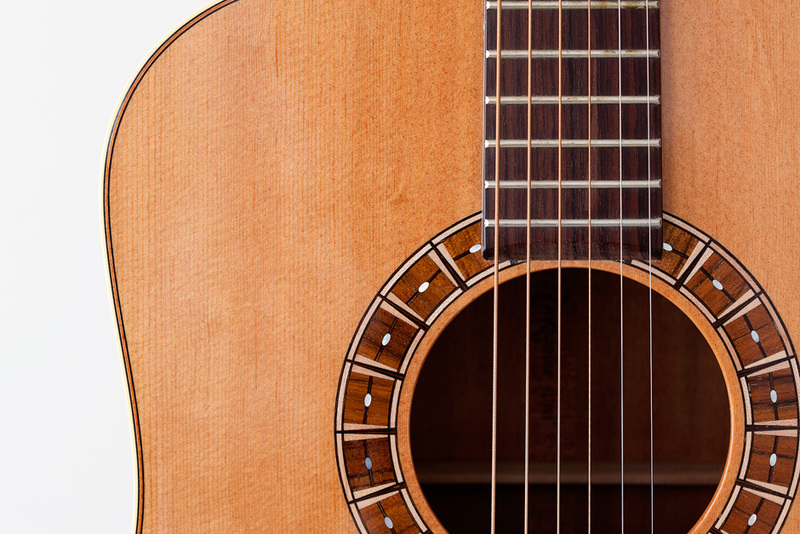 I had my heart set on one with nylon strings for a more mellow sound, and being a dreadnought means Larissa is a little too big for me, both in the way she fits under my arm and in the scale length (making it a stretch on low strings near the nut). The neck is also 1 5/8 inches, which is a too tight for some classical and flamenco styles, but this will be perfect for when I’m looking for a bright, large sound with lots of projection. 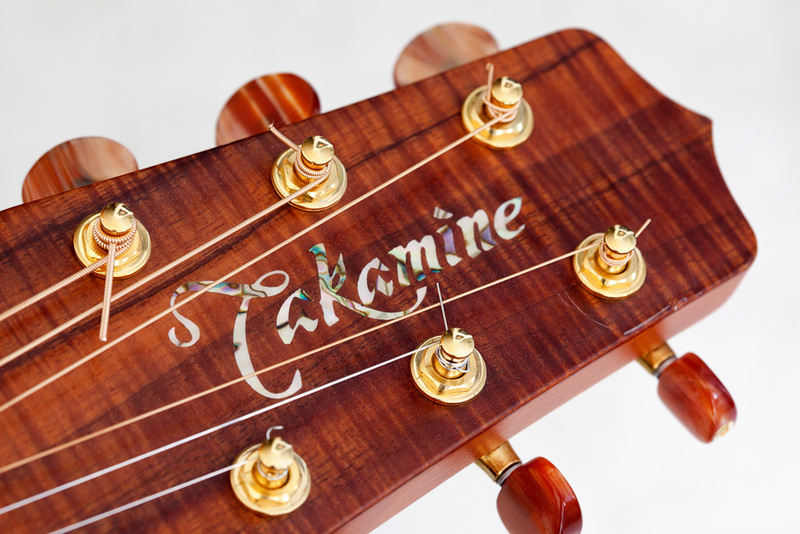 A split saddle bridge, characteristic of some Takamine’s. This is supposed to make it easier provide the best intonation to the strings, but the trade-off is that most under-saddle pick-up systems can’t be used cause they tend to be designed for single saddles. Mother of pearl logo inlay. 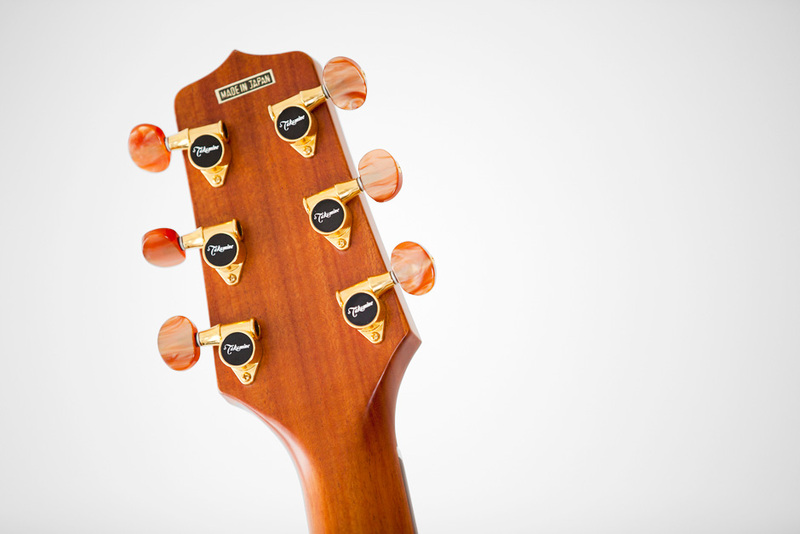 Gold tuners with pearloid buttons. WOW. This is a lovely guitar. Will check your next post to hear it. Takemines were pretty highly regarded back when I was playing, but I don’t know about as late as yours. Probably great!. My Martin D18 doesn’t have the sheer scale of this one I think – it’s no wonder it sounds rich…. and the marquetry is lovely. Thanks for posting that demo of MY GUITAR! I love the unique sound of it. Really, in a jam with other guitars, the sound if different enough to add its own unique flavor to the jam, but still blend. My only gripe about he guitar is the nut is very narrow and it can be a challenge to cleanly form open chords, but other than that it’s a keeper. I bought mine when Guitar center took over a local music shop. They had 5 out on the floor on stands selling for <$325! At that time, GC didn't carry this model so they just wanted to get rid of them. I couldn't believe my luck. I sat there for a couple hours and played each one as took the pic of the litter. Thanks again for posting that video link. it thru the mail I was indeed fortunate to get one I like. The price tag on it at that time was $ 1499.00. It had a three inch scratch that is fingernail deep but surprisingly depending on how the guitar is turned you can’t see it. I paid $ 600 with a decent hardsheel case. I often get well meaning comments on how my bridge is ” broken “. I then explain that the factory made it that way. for $ 600 even with the scratch. I wish I could hand it down but none of the grandkids play anything except video games. I really don’t know what to do with it when I’m not here. A plus with this is when I play it at Bluegrass jams and specators comment on its sound. And I smile broadly when asked, ” no, its not a Martin “. I love my f370ss. I won it at an auction in a benefit for WNCW, our western north carolina americana npr station (best in the world!!) I also have Martin D-28, HD-28, and D-35. It is hard to tell the difference with Martin strings on all and I have been playing for 36 years. I play pretty hard however, and w/o the pickguard it’s gonna start lookin like willies axe b4 too long!! So, what strings have you found for the best “balanced” sound? The guitar is bright and smoothly jazzy by it’s nature, but I sometimes find myself wishing for the low-E and A strings to have a bit more presence . 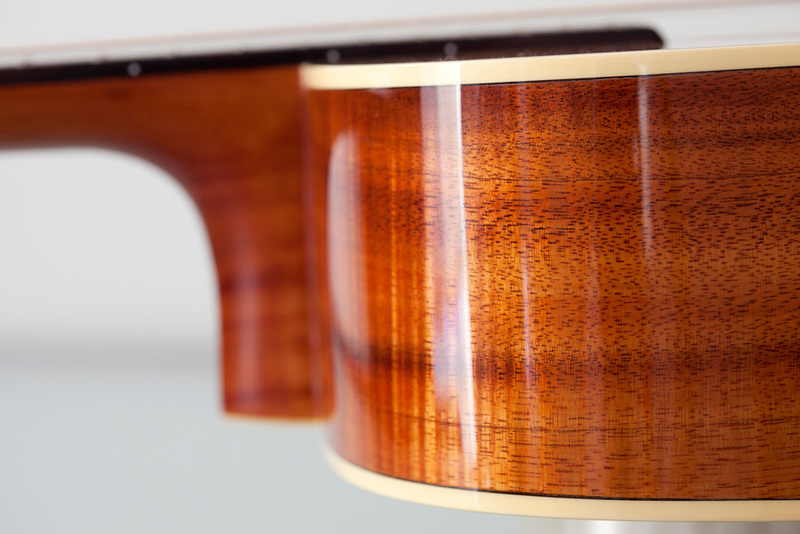 I think the natural harmonics of the Koa backs and spruce top favors resonance > A. My last set are phosphor-bronze coated and wow they really brought out the bass strings. Personally, I found phosphor-bronze coated strings to be much, much too bright for me on this guitar. But I generally prefer a mellow sound, so that’s probably why. I currently have a set of D’addario electric chrome flatwounds on there, and I find it’s the best balance to my ear. I’ll give them a try. I found that using just “normal” bronze wound strings all I heard there the top 4 strings in the chord. I haven’t tried the silk-n-steel strings he’s using in the demo .. they might be fun. I found one of these guitars in a second hand shop for a little under $600. I am absolutely in love with it! It is by far my favorite guitar I have ever owned. I would never sell it, but I wonder what this guitar may be worth. Is this a question you can help me answer? Guitars are worth what someone is willing to pay for it (just like a stock). If you found one for $600, and it was being advertised so that other potential buyers would have found it, then that’s the current going rate. That said, I’ve seen posts of others selling closer to $1k. 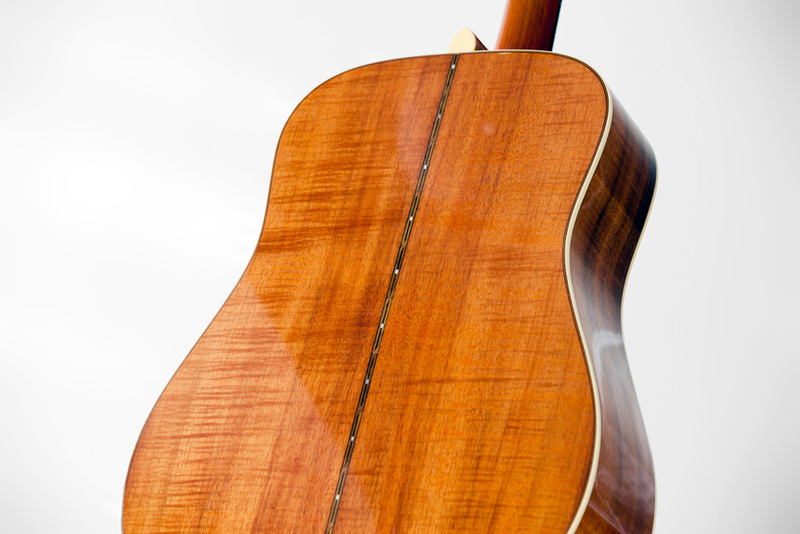 Condition also matters tremendously as well as the individual performance of your particular guitar. 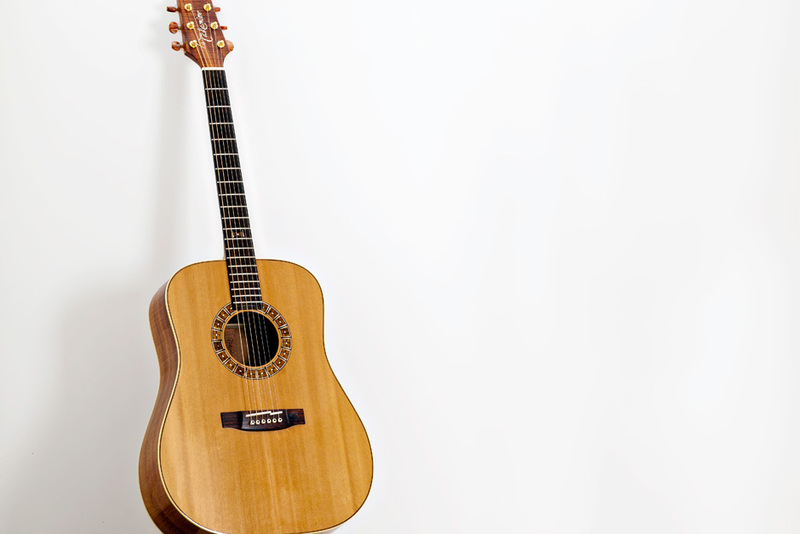 Though acoustic guitars are of the same “model”, the particulars of each individual instrument comes into play. Like I mentioned in my previous post, I had 5 of this model to audition and choose from. 2 really stood out from the rest and then I picked my favorite. So, based on your data-point and the others I’ve seen, the best estimate is between $600-$1,000. I have the same guitar as yours; it´s an absolute gem! Take care of it and don´t ever sell it! Not only were they only build for one year (2 years on the outside), but they were Tak’s first attempt at a solild-solid guitar (along with a couple other models that year). I used to have a brochure for the line, but I’ve since lost it. Remember, at this point Tak’s were known to be great “stage guitars” … prewired stage acoustics with ply parts to help keep the feedback down. Putting a solid-solid guitar out .. especially one with just artistic inlays and exotic woods (and sound) was a real gamble .. and frankly .. they didn’t sell. When a local large music store in Rockville, MD got bought by Guitar Center, GC didn’t have the F370ss SKU in their inventory .. so they took the 5 they had in stock and stands and on sale as soon as you walked into the door. I sat and played each one took the pic of the litter for low $300’s. Unfortunately, my serial number paper tag inside has long since fell out and disappeared, but I believe it showed a 98 date. They stopped producing them due to lack of sales after the first production run. I was in at the Rockville GC in Maryland and tried out the takf370ss. It was 98 or 99. I remember the price tag was $799.00. I love the sound right away but could not afford it. However, on my way to apartment I stopped by GC at Geithersburg and saw the same guitar with $300 less. I bought it without any hesitation. Still have the guitar with me. Lucky for me I played one in Allentown, Pa. on sale for $999 with it listing at $ 1499.00 but it was out of my price range. But at east I got to hear the sound. I called a music store in North Carolina I believe, actually looking for a Sigma Martin DR-41. He didn’t have one but we got to talking and he told me he had this as a demo, someone put a scratch on it and I could have it with a H.S.case for $ 600. Six was in my ballpark and we closed the deal. It was around the late 90’s or very earlier around Y2K I recall correctly. Never had someone play it that wasn’t impressed. These are sweet sounding very light guitars but quite capable of producing impressive bass as well. The way I figured I was going to scratch it anyway and get mad at myself so someone else just saved me the aggravation. Naturally that’s still the only blemish on it.